All butter Madeira cake filled with vanilla flavour buttercream and raspberry jam, topped with white icing. Wheat Flour (Wheat Flour, Calcium Carbonate, Iron, Niacin, Thiamin), Sugar, White Icing (14%), Butter (Milk) (13%), Pasteurised Egg, Vanilla Flavour Buttercream (5%), Raspberry Jam (5%), Humectant (Glycerine), Glucose Syrup, Pasteurised Egg White, Whey Powder (Milk), Milk Proteins, Salt, Emulsifier (Mono- and Di-Glycerides of Fatty Acids), Raising Agents (Disodium Diphosphate, Sodium Bicarbonate), Preservative (Potassium Sorbate). 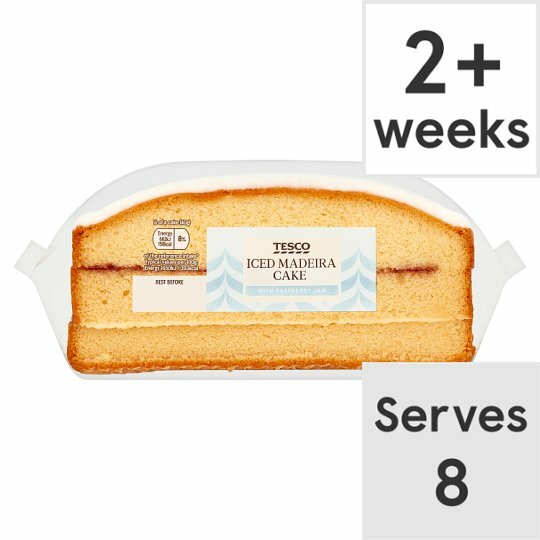 White Icing contains: Sugar, Glucose Syrup, Rapeseed Oil, Palm Oil, Rice Starch, Acidity Regulator (Citric Acid). Raspberry Jam contains: Glucose Syrup, Raspberries, Gelling Agent (Pectin), Acidity Regulators (Citric Acid, Trisodium Citrate), Colour (Anthocyanins), Preservative (Potassium Sorbate), Flavouring.